Some time ago, rural business entrepreneur Becky McCray from the Small Business Survival blog posted an article about a reader who lamented that wholesalers charged high prices to small-town retailers. She wondered if anyone knew strategies to get wholesalers to lower their prices. It didn’t take long for the conversation to turn into the common subject of how small businesses, rural or not, can compete against their local Walmart – who is always (presumably) getting great prices from its wholesalers and selling products on the cheap. This happens to small retailers across the country every day. They have been operating happily and profitably for a number of years in their little niche. Then, one day, one of the biggest discount retailers in the world decides to open a store nearby. Traffic to their store dies within days or weeks of the grand opening. Before long, the small retailer goes out of business. Another entrepreneur becomes an unemployed casualty in the battle between small retailers and big-box companies. It doesn’t have to be like this – at least, not for everyone and, hopefully, not for you. 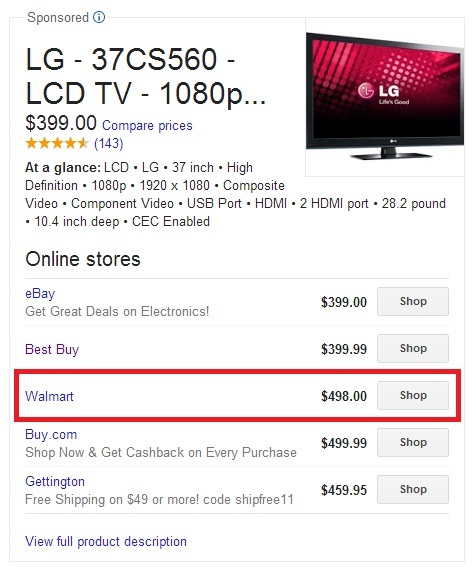 Is the “Walmart Price” a Myth? Walmart is a business. And, like every business, its objective is to gain market share, increase revenues, and generate returns to its shareholders. They have their methods. And, like them or hate them, Walmart is very good at what they do. The fact that they are one of the most successful companies and have lots of satisfied customers is proof that they are great at what they do. No use or sense in denying it or complaining about it. Fortunately, they are not perfect either. I believe that most people think that Walmart is the cheapest store for everything. Walmart certainly tries to promote that image in its ads. However, my recent price comparison experiences prove that this is not always the case. For many items, I found that other retailers had either cheaper products, a better value – or both. That has been my experience with Walmart when shopping for tables, computers, and flat-screen TVs. Don’t believe me? Look at the price comparison on the right. 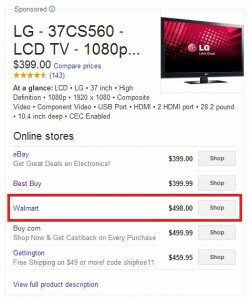 In the case of that specific TV, Walmart is a whopping 24.50% more expensive than Best Buy. That is just one example, and I have seen many. Likewise, I have found that their in-store service leaves much to be desired. While their employees are generally nice and professional, they are not nearly as knowledgeable about their products as those folks who work in specialty stores. This leads me to my next point. It’s well known that Walmart once wanted to take a piece of the DVD rental market. And many folks were concerned that it wouldn’t be long before they took the whole market. But. in 2005, they lost. They capitulated to Netflix, as this article shows. Netflix, a well-run company that specializes in the online movie rental business, is much (much!) smaller than Walmart. But they won. Oh, and you still think that Walmart is the king of cheap stuff? Not always. Walmart is also losing customers to these specialty stores (hint: they sell things for $1). They may be formidable – but not invincible. This is an important point and a key to your success. But the question is still open – how do you beat them? Most people try to compete against Walmart by lowering their prices. In my view, going into a price war against Walmart is a losing proposition. Even if you are able to get cheaper prices than Walmart (maybe temporarily), they have already won the perception war. Regardless of the reality, everyone always thinks that Walmart has the cheaper prices, and Walmart is very good at furthering that perception. Ultimately, Walmart has a well-oiled purchasing machine and could easily win a price war with any small or mid-sized retailer. This is almost a sure-fire way to go out of business. So – how do you compete? Fortunately, Walmart usually announces its store-opening plans with plenty of lead time. They often (but not always ) need to go through lengthy approval processes. This is definitely true in larger cities, where opening a big-box store can take a couple of years. I assume it is faster in rural areas. This is good news for you. The process can be so slow that you should have time to adapt – and evolve. And, hopefully, succeed. The first thing to consider is finding profitable niches within your industry and start focusing in them. Use niches where you can deliver true superb value. Let me use a couple of examples. If you own a liquor store that sells beer and wine, consider moving to more specialty beers and wines that won’t be found at Walmart. Then, cater to folks who really like quality beer and wine. Or, if you have a shoe store, focus on selling specific types of footwear that you won’t find at Walmart – like quality leather shoes. In these cases, you may need to go a bit upscale. But it’s time to look at your products, try to find profitable niches, and prune those products that won’t help you survive. Your next step is to develop name recognition in your selected niche or niches. To use my previous examples, if you own a liquor store, you may want to host wine tastings or specialty beer tastings. Maybe you can convince the brew-master of a local beer you sell to come to your shop and do a beer seminar. If you own a shoe store, you may want to give short seminars about how to select proper footwear and the health benefits of wearing the right footwear. The point is that you want to be the “go-to” store or person for your product niche. Additionally, implement a customer communication and interaction strategy. Keep in touch with your customers. You can use tools like Facebook and email lists to do so. Don’t make the mistake of overdoing it and swamping your clients with countless and needless emails or Facebook posts. They will quickly get rid of you. But do post relevant articles and information on a regular basis. If you are new to social media, you can learn a lot from Becky McCray and Chris Brogan. One last point – remember what you actually sell. Many people think that Apple just sells great products. They don’t! Apple sells a great customer experience, of which great products are only a part. Don’t buy that theory? Go to an Apple store. It’s a great lesson on how to treat a customer very, very well. These guys are polite, professional, and seem to live by the motto “You will be satisfied!” Their slick products are part of an even slicker bigger picture. That’s a great model to follow, and it’s how you keep customers. Let’s see if your local big-box retailer treats its customers like that.